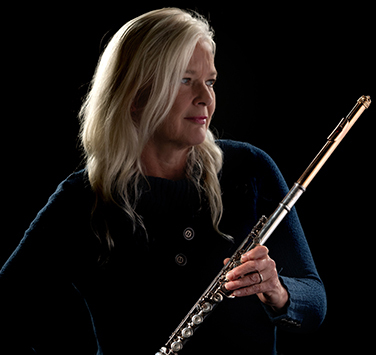 Described as a flutist with a lovely tone, a fine sense of phrasing, and natural musicality, Patricia Creighton is currently Principal Flutist with Symphony Nova Scotia, a position she has held since 1983. As a chamber and orchestral artist, she has performed with such distinguished artists as Julius Baker, Robert Cram, Victor Yampolsky, Isaac Stern, Maureen Forrester, the late William Tritt, Peter Bowman, Steven Dann, Fred Sherry, Malcolm Lowe, Erica Goodman, Anton Kuerti, Peter Allen, Jeanne Lamon, Georg Tintner, Simon Streatfeild, Mario Bernardi, Grant Llewelyn, Denise Djokic, Rene Fleming, Bernhard Gueller, and many others. She is a regular guest artist with the Scotia Festival of Music and most Nova Scotian concert series and with the New Brunswick Music Festival. She has performed across Canada and the United States, as well as Germany, Yugoslavia, Switzerland, Czechoslovakia, and Mexico. Her extensive repertoire spans from baroque to modern in solo, concerto, chamber, and orchestral literature. Patty has been featured with the Vancouver Symphony, the Calgary Philharmonic, many times with Symphony Nova Scotia, and with the Scotia Festival orchestra as concerto soloist. Patty world-premiered a new flute/harp piece called ‘Of Golden Apples’ by Canadian Andrew MacDonald with Karen Rokos on September 22, 2012. Patty also premiered a new flute and piano work composed by her husband, Peter Allen. The piece was commissioned by the Nova Scotia Registered Teachers’ Association and performed by Patty and Peter on the Cohn stage July 5, 2013. Patty Creighton can be heard regularly on CBC Radio. Abraxas, her first compact disc, produced by CBC, includes twentieth-century flute and piano repertoire with Peter Allen. Her second CD is called The Transcontinental and represents musical snapshots of different countries. Her third disc is a completely improvised disc with flute, percussion, and diggerido called The Twelve Celtic Winds, and depicts the various characteristics of the winds that the ancient Celts studied in order to carry out their daily living. Patty’s fourth disc, Melodies of Love, is a disc of beautiful melodies the world loves with her Nova Brilliante duo partner, harpist Karen Rokos. This disc was nominated for the 2008 Best Classical Album for both the East Coast Music Awards (ECMAs) and the Music Nova Scotia Awards. Her fifth disc, called Wind Song, is a live CBC broadcast performance with pianist Peter Allen and includes works by J.S. Bach, Poulenc, Prokofiev, Debussy, Colgrass, and Bartok. Wind Song was nominated for the 2009 ECMA Best Classical Album. Her discs can be bought at Symphony Nova Scotia concerts at the Symphony Boutique, from her website, and also through www.cdbaby.com and iTunes. Born and raised in Kitchener, Ontario, she won prizes at an early age in the Kiwanis Music Festival – the Ontario Top Prize, the Guelph Spring Festival Competition, and the DuMaurier Search for the Stars. She received a Bachelor of Music at the University of Toronto, where she studied with Nora Shulman and Jeanne Baxtresser. During and following university studies, Patty attended the Banff Centre for the Arts and won her first audition to become Principal Flutist of Symphony Nova Scotia the year she graduated from university. During her first year in Halifax, Patty won a B Grant from the Canada Council to pursue further studies in Banff. She has also attended the Johannesen International School of Music and individual master classes and/or lessons with the late Jean-Pierre Rampal, James Galway, the late Marcel and Louis Moyse (ten years), the late Samuel Baron, Robert Aitken, Robert Cram, William Bennett, Jeanne Baxtresser, and Julius Baker. Aside from a busy performing schedule, Patty now shares her love and knowledge of music by teaching master classes and seminars at Dalhousie University’s Department of Music. You can visit Patty’s website at www.patriciacreighton.com, or visit her Nova Brilliante duo at www.novabrilliante.com. A glowing review of one of Patty’s performances is available here. Why did you begin playing the flute? I was always transfixed by the sound. Why do you play the flute? I play my instrument because I just love music so much, and also because it is a great practice (like the Buddhist meditation practices) which always reflects the inner state of my psyche. It keeps me honest about myself, and it is extremely challenging. To be the master of an instrument is probably the hardest thing I’ve ever done. It allows me to express my deepest most complex emotions in a non-verbal way. Swimming, photography, long walks with friends, meditation, and making movies. What’s something someone would be surprised to hear about you? Breathe deeply, swim, walk, lie under a tree.